Whenever people ask for suggestions for outdoor wireless coverage or building-to-building links, recommendations usually include products from EnGenius and Ubiquiti. And while I've reviewed a few EnGenius products (the disappointing ESR9885G most recently), I've never had a Ubiquiti product on the SNB bench. So when a reader posted a mini-review in the Forums that raved about Ubiquiti's PowerAP N, I figured it was as good a time as any to take a look. A few review requests to Ubiquiti went unanswered, so I ordered one from Amazon and went to work. Ubiquiti mainly focuses on professional level products designed for deployment in carrier or ISP-based wireless networks. All of its products run Ubiquiti's full-featured AirOS using Ubiquiti's proprietary AirMax MIMO TDMA protocol, standard 802.11a/b/g/n or both. Among Ubiquiti's other offerings are its large-scale Wi-Fi UniFi system, antennas and radios and motherboards for those who prefer to roll their own routers. 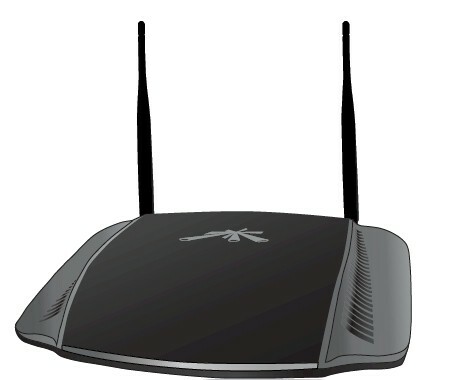 There is also a small Consumer Products line that includes AirRouter (single-stream 2.4 GHz N), AirWire (two-stream 2.4 GHz N Ethernet bridge), WiFiStation (single-stream 2.4 GHz N USB client) and the PowerAP N.
The company doesn't sell directly from its website, but the products are widely available via a network of resellers and etailers. The first thing you need to know about the PowerAP N is that its name doesn't properly describe it. A glance at its backside (Figure 1) reveals four 10/100 switched ports and a single 10/100 LAN port that indicate routing is among the duties that it can perform. In fact, the PowerAP N can be configured to become a wireless router sharing a single WAN IP via NAT, a wireless router without NAT, an access point with or without WDS bridging repeating, a wireless bridge that doesn't require a WDS partner or finally as a WDS bridging / repeating partner. There are a few other permutations possible, but these are probably enough for most users. The PowerAP N's all-plastic case is a bit smaller than you might expect and has lots of top vents, but none on any other of the surfaces. And with no heatsinks on the parts inside, they could get a bit toasty. With no Gigabit switch to contribute to the heat load, however, I wouldn't expect heat-related problems in normal consumer use. Note that the design isn't stackable and there are no mounting slots on the bottom for wall / ceiling mounting. Some of the Amazon reviews noted problems with the two RP-SMA antenna connectors becoming loose when the large-ish 6 dBi antennas (which provide twice the gain of the antennas you usually get in wireless products) are attached. I didn't have any problems with that, but I did notice the tendency of the antennas to flop down if they were not snugged down properly. Still, after a look at how the antenna connectors are fastened to the case (lockwashers but no molded recess to keep the connector body hex nut from turning), I'd advise not overtightening the antennas when you install them. The topside of the PowerAP N has blue backlit status / activity lights for power, Internet (WAN), Wireless and each of the four Ethernet LAN ports. Ubiquiti asked the FCC to permanently block the internal product photos that other companies sometimes only delay. So after I completed my testing, I had to open my sample to see what's inside. Figure 2 shows the PowerAP N's innards with the RF shield top removed. It's an all-Atheros design using an Atheros AR7240 Wireless network processor, which includes the four-port 10/100 switch and 10/100 WAN port PHY. The radio is an Atheros AR9283, which I assume is a 2.4 GHz 2x2 N SoC radio. Atheros device information is much harder to come by since its purchase by Qualcomm and neither of these parts are listed on Qualcomm's WLAN page. 32 MB of RAM and 8 MB of flash finish up the design.